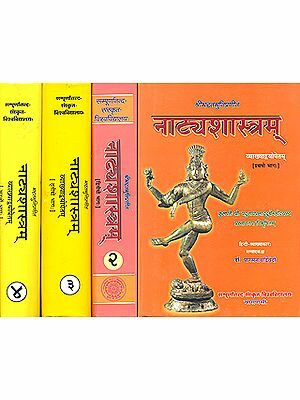 Bharata’s Natyasastra is on encyclopaedia of Dance, Drama and Music. It has 36 or 37 chapters. The Chaukhamba edition contains 36 chapters while Kavyamala edition contains 37 chapters. 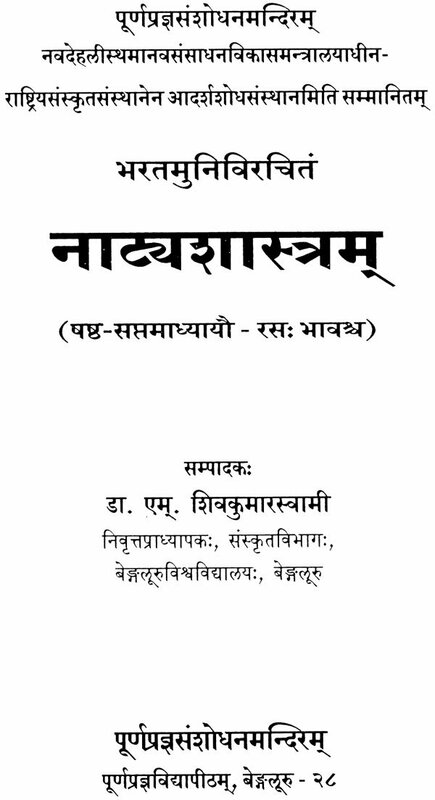 Abhinavagupta followed a text of Natyasastra containing 36 chapters. This is evident from his statement - (Introductory stanza No. 2 in the beginning of his Abhinavabharati, which will be noted henceforth as A.B.). Again on p. 8 - of the I volume, Abhinavagupta says: (A.B.). It is found in the Kavyamala edition that the 36th chapter has been divided into two chapters as 36th and 37th. The Natyasastra gives a detailed account of the sources of aesthetic pleasure. It deals with the architecture of the theatre, metres to be employed, the postures, movements and gestures of actors. It given an exhaustive treatment of the mode in which the actors are to deliver their speeches. It presents an elaborate analysis of the different types of dramas, of the structures of the dramas and of their styles. It also gives directions about the songs to be sung and the musical instruments to be used and treats in detail of the musical notes and their combinations. This work is outstanding in the range of works on dramaturgy in the world. It is unparalleled in its comprehensiveness, scope and literary and artistic flourish. It occupies a unique place as the earliest available source of Indian dance, drama and music. As a background to the study of this work either fully or in parts, an account of the author, his date and his contribution to the field of poetics and dramaturgy should be necessarily given. Bharata is ascribed with the authorship of Natyasastra. The date of Bharata as the author of Natyasastra is discussed here on the basis of certain evidences. Since there are frequent additions made to the text of Natyasastra, and since there are substantial discrepancies in the manuscripts of the work, the discussion about the date of the work should refer to a time when the principal structure and chapters of the work had been put up with only some verse or verses inserted here and there later. Even that time is only probable. This is decided with the consideration of the upper and lower limits of the date of Natyasastra. There are references to Visvakarman (2.7 and 12), Puranas (14.46, 27.59), Purvacaryas (15.22), Kamatantra (23.37, 52), Brhaspati (24.88, 34.79), Narada (32.1, 32.484), Tandu (4.17), Pasupatas (13.85), Sabara, Abhira and Dravida (18.36), Soka (18.40) in the Natyasastra. These references do not much help in inferring the date of Natyasastra. They just make it probable that the present work is not much older than the beginning of the Christian era. The probable upper limit is thus 1st century A.D. The lower limit can be indicated with some certainty. The evidences are: (i) Kalidasa refers to Bharata in his Vikramorvasiya (1. 18). This leads to the inference that before 450 A.D. at the latest Bharata had been regarded as founder of Natyasastra. It can be also inferred that he had spoken of eight Rasas and had performed a drama before the gods. This shows that by 450 A.D. the legend about the birth of Natyasastra in the first chapter and the discussion about eight Rasas in the sixth chapter existed. In Kalidasa’s Raghuvamsa xix. 21, there is a reference to Khandita Nayika. This points to the eight Nayikas enumerated and defined in the Natyasastra 31. 109-110 and the subsequent verses. Again in Raghuvamsa xix. 36, it is said: This has reference to Natyasastra 24.1. (ii) Gathasaptasati of Satavahana (Hala) says in a verse (No. 344) that “embraces are the ‘Purvaranga’ of the drama of love”. This points to ‘Purvaranga’ treated in the fifth chapter of Natyasastra. The date of Gathasaptasati is between 200 to 400 A.D.
(iii) The Yajnavalkyasmrti, after stating that by reciting the Saman songs properly the singer reaches Brahman, extends the same reward to those who sing seven kinds of non-Vedic songs called Aparantaka, Ullopyaka, Mandraka, Prakari, Ovenaka, Sarobindu and Uttara. The Natyasastra gives a treatment of these seven non-Vedic songs called Mandraka, Aparantaka, Prakari, Rovindaka (for Sarobindu), Ovenaka, Ullopyaka and Uttara in the 31st chapter. Scholars like P.V. Kane are inclined to believe that these verses in Yajnavalkyasmrti are taken from Natyasastra. Then Natyasastra should be placed not later than the first or second century A.D.
(iv) All the ancient writers on Alankaras, Bhatti, Bhamaha, Dandin, Udbhata define more than thirty Alankaras. Bharata defines only four Alankaras called Upama, Dipaka, Rupaka and Yamaka. Therefore, it is possible to say that Bharata preceded these writers by some centuries. On the basis of the above evidences, it is possible to put 300 A.D. as the lower limit of the date of Natyasastra (Bharata). Before 300 A.D. there existed a work under the name of Bharata containing a Rasa theory and dealing with dramaturgy. Although Natyasastra is a work on dance, drama and music, yet in the present context of poetics, it is proposed to give an account of the topics of Alankarasastra. The 16th and the 17th chapters of Natyasastra are devoted to the treatment of four concepts of Alankarasastra, viz., Alankara, Guna, Dosa and Laksana. In chapters 6 and 7, Bharata enumerates eleven Angas of Natya, viz., Rasa, Bhava, Abhinaya, Dharmin, Vrtti, Pravrtti, Siddhi, Svara, Atodya, Gana and Ranga and after mentioning their divisions, deals in detail with Rasas and Bhavas. Before explaining the concepts of Alankara, Guna, Dosa and Laksana, Bharata gives a definition of Kavya which brings out the nature of poetry and prose appealing to the spectators:(N.S., 1. 124). The auspicious kavya of the spectators of drama should be rich with soft and charming words, free from words having hidden meaning, easy of understanding for the ordinary people, suitable to the dramatic representation, abundant with Rasas and endowed with the arrangement of Sandhis. With this definition in view, Bharata deals with the concepts of Alankara, Guna, Dosa, Laksana, Sandhis, Sandhyangas, Rasa, Bhava and other details about drama. 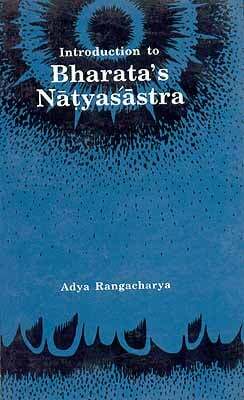 Bharata’s Natyasastra is an outstanding primary source on ancient Indian Dance, Drama and Music. It deals with some principles of literature as a part of Vacikabhinaya. Chapters VI and VII have been a great contribution to the field of Indian literary criticism. A study of those chapters gives us a glimpse of a culmination of a long period of development in the field of Dance. Drama and Music with some principles of literary criticism. This edition of VI and VII chapters with an Introduction, Translation and Notes in English has been prepared to meet the needs of the students of the Graduate and post-Graduate levels. The Introduction called “About the Author” gives an account of the date of Bharata and his contribution to literary criticism. Chapters VI and VII dealing with Rasa and Bhava respectively follow the Introduction. An authentic version of the text of those chapters has been given. It is divided into suitable paras with translation and critical notes. Extracts from Abhinava-bharati have been taken in the notes for the elucidation of the points in the text. I sincerely hope that this will provide enough material for the benefit of the scholars, students and other readers who are interested in the study of Rasa and Bhava. I bow with reverence to the holy feet of H.H. Vishweshatirtha Swamiji for the ‘Anugrahasandesha’ and the blessings. I am grateful to Prof. D. Prahlada Char, the Chairman and Dr. A.V. Nagasampige, the Director of PPSM, for having taken up this work for publication. I convey my thanks to Shree Graphics, Thyagaraja Nagar, for having done the D.T.P. work neatly. My thanks are also due to staff of Nandi Process, for having got this work printed neatly and quickly.